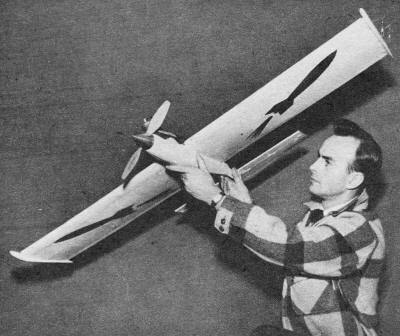 Walter Musciano is a very familiar name to modelers who cut their teeth on on control line model airplanes back in the middle of the last century. His flying hobby began in the 1930s are a Brooklyn, New York, schoolboy. He won his first contest in 1936. Since that time, Mr. Musciano has designed scores of model airplanes and won numerous contests. This article from the July 1951 edition of Air Trails covers the building of his famous Stunt Rocket. It was a breakthrough design due to its large size and huge, powerful ignition engine. AMA Plans Service still sells the plans. Many books by Walter A. Musciano are available through Amazon.com. Designer Musciano with his giant; upright ignition motor was early experiment. The Stunt Rocket is an outstanding example of the application of modern styling to a proven force arrangement for competition stunt models. Its large size (550 square inches) is a departure from "mosquito" stunt models. Instead of attempting realism by means of a bubble canopy (a la military motif) or open cockpit (pre-war private plane type), we omitted these creators of parasite drag and painted a flush cockpit in the nose section similar to the more recent full-scale rocket research planes. 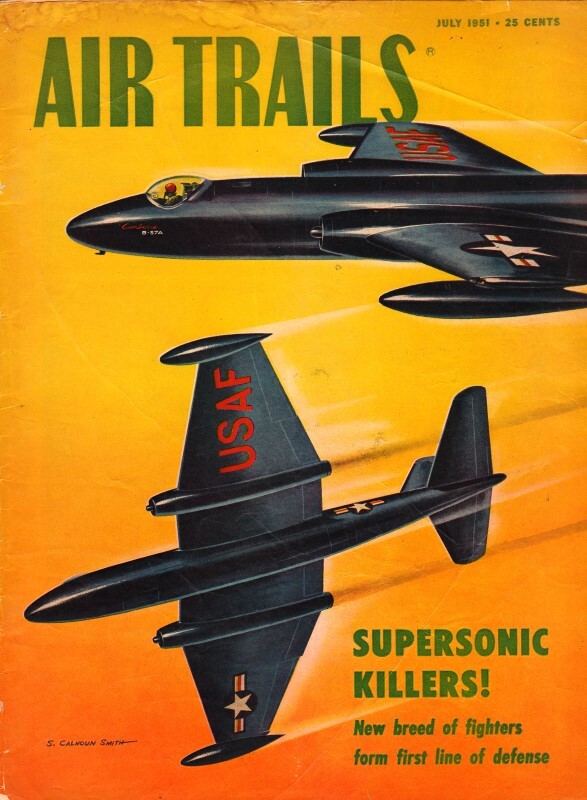 The projectile fuselage profile coupled with the Froom needle nose spinner completes the illusion of a supersonic rocket plane with the assistance of the rakish fin. In view of the fact that the wing is the main structure, it is first on the list to be fabricated. Only the tip and root rib patterns have been given on the plan. These should be cut from the specified stock; then cut rectangles to the rough dimensions of the remaining ribs. Spot-cement these, rectangles to each other with the root and tip ribs at either end. Now carve the ribs to shape using the tip and root ribs as patterns. It will be noted that the leading portions of all ribs up to the front spar are identical. Notch the ribs for spars, leading edge and sheet covering. The forward bottom spar is pinned to the workbench directly over a full-size plan and the ribs cemented to it. This bottom spar must be raised from the workbench 1/16" with slivers of balsa before the ribs are attached. Cement the top spar in place and add the leading edge. Add the rear top spar and top trailing edge piece; do not twist wing structure during this operation. When dry remove the structure from the workbench, bevel top trailing edge piece as indicated, and cement the remaining spar and trailing edge piece in place. The bellcrank assembly is installed. Select a commercial type with proportions similar to the one illustrated and bolt it to a piece of hardwood which is cemented securely to the wing structure. Attach a length of 1/16" music wire to the bellcrank to serve as control rod. Pass the lead-out lines through the holes in the ribs and attach securely to the bellcrank. The 1/16" sheet webs between the ribs along the spars are cemented in place. Grain should run vertically on these webs and they should be cemented to ribs as well as spars. Note that no web is required at bellcrank installation. Wing leading edge is covered with 1/16" sheet balsa forward of front spars. We prefer, a slow-drying cement for this operation. The wing center section is also treated in this manner. Something in the way of a stunt model, you say? Something big? Here's a project to keep you busy at the bench for awhile, then provide lots of flying fun. Sandpaper the entire structure well and re-cement all joints, Cover wing with heavy paper, using cement as the adhesive. Before watering the wing cut end plates and carve and sand to a streamline shape. These end plates not only improve model's appearance by resembling tip tanks, but also improve wing efficiency by preventing the air from spilling over the tip which would decrease lift and increase drag. The left end plate is added at this time, the right one after the fuselage keel is slipped over the wing. Now water the wing and, when dry, apply four coats of clear dope. Give each coat plenty of time to dry. Fuselage is built directly onto wing. Cut the 1/4" sheet balsa keel, being sure to notch it for engine mounts, fuel tank, wing and stabilizer. Slip in place, cement keel to wing. While this is drying cut all formers from specified stock and cement them to keel. Cement engine mounts securely to keel; this location will vary according to the engine you intend to use. Plan the mount placement carefully before notching bulkhead "C."
We used a drop-off type of landing gear with success. If you prefer a fixed gear the performance should not suffer too greatly. Make the take-off gear first. Be sure to bind joints well with soft wire and solder liberally. Use largest wheels you have on hand (over 2 1/2" dia.) because they are less likely to snag in grass or other undesirable surfaces. Cut a piece from a discarded tin can to the shape shown on plans. Now slip the brass tubing over take-off gear prongs and lay this on tin backplate. Solder the tubing, with prongs still inside to backplate. Use plenty of flux and solder well. When cool, the prongs can be removed and now you will be certain that they fit tubes exactly. Backplate assembly is screwed or bolted to the bulkhead "B." Install fuel tank. Attach Neoprene or plastic tubing to the tank vents. Any commercial stunt tank will perform well if it is correct size for the engine. Cut tail surfaces to shape and sand to streamline section. Hinge elevator to stabilizer, using crinoline strips, and fasten securely the control horn to elevator. The stabilizer is cemented to keel and the control rod connected to horn. Test the control system and apply three coats of cleat dope to tail surfaces. Planking the fuselage is much easier than some modelers would have you believe. Using a slow drying cement, attach each successive strip 180 degrees apart. 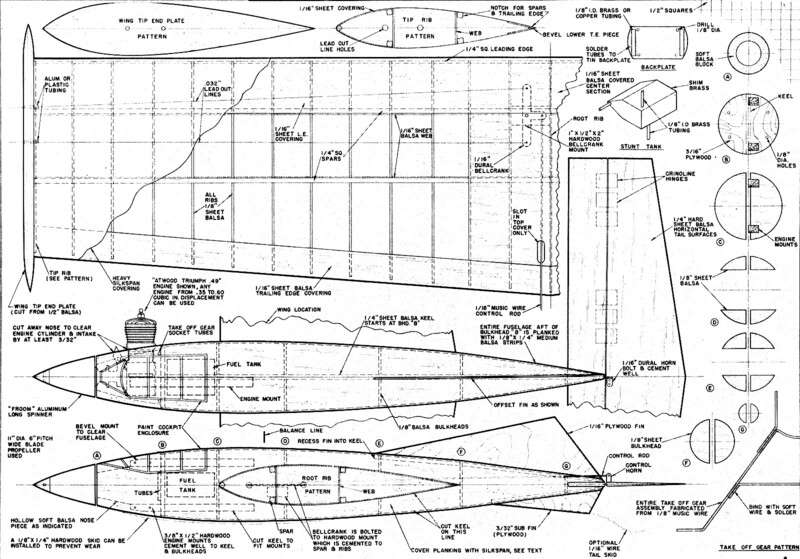 In this way fuselage will ·not bend out of shape during construction. Sides of the planking strips must be beveled and all strips should taper uniformly towards the tail. Sand fuselage well when dry. Bolt engine in place and add the Froom aluminum spinner to it. Now select soft balsa blocks for nose pieces. These are cemented lightly along horizontal center line and carved roughly to shape. Separate the blocks, and hollow them around the engine. Cement the blocks to plywood bulkhead "B" and to each other, again very lightly, and this time carefully carve blocks to fair smoothly between fuselage and spinner. Sand smoothly, then remove and hollow as plans indicate. Fuel-proof the cowl interior and replace nose .pieces, this time permanently. Fin is cut from plywood sheet and sanded smooth, Cut a recess in fuselage top and cement fin securely in place. We covered the fuselage, a small area at a time. After this operation, three coats of clear dope were applied with light sandings between each coat. The prototype model is colored red and white with a gray cockpit enclosure. Apply three coats of white dope and mask-off, then add red dope. Be sure to use fresh tape at all times and push edges close to model's surface with your fingers to prevent color from seeping through. The white leading edge trim, rocket insignia and all lettering were made from Trim-Film. Two coats of transparent fuel proofer should be applied to entire model. If a fixed gear is used we recommend as smooth a flying site as possible. Our initial flight was conducted with 0.016" diameter lines, 60 feet in length. Once we were familiar with the flight characteristics (extremely maneuverable with moderately high speed - 70 mph) , we graduated to seventy and then eighty foot length of 0.016" stainless steel flight lines. It is with these longer lines that the model really does its stuff! We experienced no difficulty in keeping lines taut with the fin offset shown. However, should the model indicate a tendency to turn toward the circle center, a one or two degree engine offset should remedy this condition. If balanced as shown and built carefully and flown with good sense, the Stunt Rocket will provide many flights that are truly "out of this world." Fuselage. 1. pc. 1/4" x 2" x 36" hard balsa, keel. 1 pc. 1/8" x 2" x 18" medium balsa, formers. 1 pc, 3/16" x 3" x 3" plywood, bulkhead "B". 20 pcs. 1/8" X 1/4" x 24" medium soft balsa, planking. 2 pcs. 3/8" x 1/2" x 6 1/4" hardwood, engine mounts. 2 pcs, 1/8" I.D. x 1 1/2" brass tube, L.G. sockets. 2 pcs. 3 1/4"· x 3 1/4" x 1 1/4" soft balsa, nose blocks. 2 2 1/2" dia. or larger rubber-tired wheels. 1 pc. 1/8" dia. x 36" music wire, take-off gear. 1 sheet Silkspan; covering. Wing. 7 pcs. 1/4" X 1/4" x 36" hard balsa, spars, leading edge. 6 pcs. 1/8" x 3" x 36"